Check out those cool PSPs! 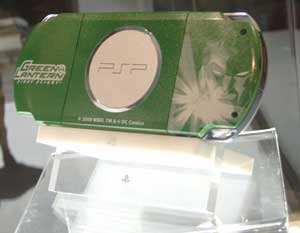 I'm surprised that Sony would have custom PSPs made to celebrate Comic-Con. Though they do have somewhat of a history of supporting Comic-Con. I'm a big comic book fan. In fact, I aspire to create comics, draw and maybe write them. Comic-Con International, held every July in San Diego, is the biggest comic convention in North America, and one of the biggest in the world. I've only been to Comic-Con 2 times; in 2004 & in 2006. In 2004 I doubt I even heard of the PSP-- or if I did, I dismissed it as being way too expensive and hard to get. I know that's what I thought of it when I first heard about it. But by July 2006, my PSP-1001 was my near-constant companion. So it was a given that I took it with me to San Diego. For the last 10 years or so, Comic-Con has really expanded to cover a lot more than comics. Movies, tv shows, books, toys... pretty much anything nerdy had a place at Comic-Con. And yes, "nerdy" includes video games. I didn't expect much there, but I knew there was a "PSP University" panel going on that I *HAD* to attend. Except..... it was on at the exact same time of an Activision Marvel Ultimate Alliance panel that had... Stan Lee. Oh crap. Stan "The Man" Lee. One of my goals this Comic-Con was to see the elder Statesmen of comic creators; Golden and Silver-Age artists & writers, because let's face it, their time is short. In 2004, I remember walking out on a panel that had Will Eisner (the Spirit) on it because it was really boring. I regret that I didn't put up with the boring guests and stayed for Eisner, because he died shortly after that appearance. So I wasn't going to miss any chances this time. Luckily the PSP University panel was right beside the Stan Lee one. I stayed for most of the Stan Lee one, then rushed next door to the PSP University panel right at the end. Once in there, I grilled a bunch of 13 year olds on what was covered; basically it was junk like how to put photos & video on your memory stick. "Did they mention the GPS???" I asked. "Umm... yeah I think so...." was the consensus I got. But the coolest part was, once I was in the room, there was a lineup to get out of it. The line was because Sony was giving everyone in the room a free 32 MB memory stick loaded with bits of media for playback on their PSPs. I remember the Loco Roco demo being one of the things on it. Yeah, 32 MB isn't all that big... even then, I had a 2GB memory stick in my PSP.... but it was a cool freebie. I should back up and talk about the first PSP experience at Comic-Con, before the PSP University one. On the showroom floor, which is populated with comics/toys/books/whatever dealers and displays by big companies... I'm wading through it, and I come across the Nintendo booth. It was this massive half-circle display with big DS Lite props along the top of the half circle, displaying stuff. But what was amazing was that the floor of the half circle was just a plain floor filled with people sitting around playing DS Lites. There were at least 100 people there.... I don't know if they were playing Mario Kart DS or what. Probably bunches of game-sharing games. I didn't know anything about the DS back then. After seeing that, I thought, "Oh man... what will Sony's booth be like???" I immediately started picturing PSPs dancing in my head.... ok, I was really psyched to maybe have some downloadable demos or something. But when I get there it's like... 6 PSPs mounted on a display. Oh boy. And no downloadable anything.